Welcome to our Region of Trails! 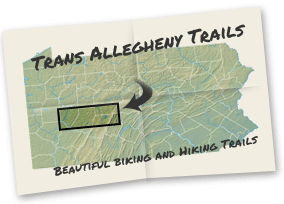 Here in the heart of Pennsylvania’s Allegheny Mountains, the Trans Allegheny Trails are a system of rail-trails – with attitude. Parts of them are almost level, while other sections are downright challenging. That’s part of the fun for riders who like to get their hearts pumping and don’t mind breaking a sweat. You don’t have to be that kind of rider to enjoy the Trans Allegheny Trails, though! Most sections are typical rail-trail (less than 3% grade) and run through some of the Alleghenies’ most beautiful scenery. The watercourse of a historic flood. This website explores all of that and more! Whether you are a hard or easy rider, you’ll find trails that suit your style. Come for a day, a weekend or a week! Tools here will help you to decide which trails to ride, build an itinerary, get directions, interactive maps and find the necessary amenities of bike shops, food and lodging. Experience a region of rail-trails with attitude!